From a young age, Alberta native Karly Heffernan, now a senior, had already set her sights upon a dream which many athletes aspire to achieve. Like many, she had grown up with the sport, devoting countless hours to something she loved — ice hockey. In the fifth grade, Heffernan joined a sports academy, an experience she called her childhood dream. In high school, she joined the Vimy Ridge School for Athletes in Calgary, enabling her to travel throughout the United States playing a sport she loved with a team she grew up with. At age 16, she joined the Canadian National Team, playing in her first world championship. In her first season for the Crimson, Heffernan earned 20 points (9–11—20) through 35 games, registering a career-best four points on two goals and two assists in the 7-1 win over Brown on Feb. 7. 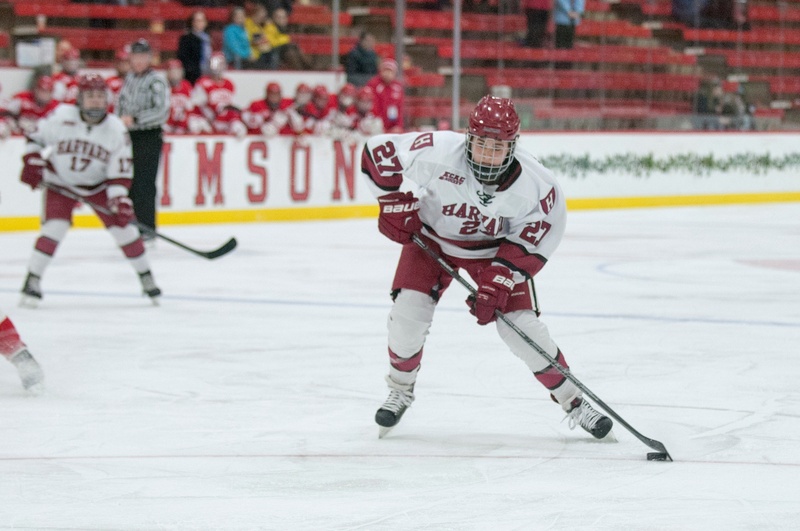 In the 2015 ECAC Championship game, the team felt her presence through a tally and an helper as Harvard claimed a 7-3 victory over Cornell. As a sophomore, she scored in the second ECAC quarterfinal game at Colgate, capping off the season with 24 points (8–16—24) through 32 games. Following that season, Heffernan was invited to a Team Canada training camp in May. Near the end of an intense day, she felt a pop in her foot. Nothing too out of the ordinary, and definitely nothing that she felt she couldn’t overcome. It was only months later, at the start of the 2016-2017 fall season, when doctors found that her stress fracture had become into a serious fracture, leading Heffernan to decide to take a year off. Following a year off to rehab her foot, Heffernan came back prepared to play in the 2017-2018 season. However, continued pain required her to undertake a second surgery on her foot, once again sidelining her for the entire season. After heavy consideration with friends, family, teammates, and coaches, Heffernan decided to take a step back from hockey. After over two years off the ice, Heffernan has now embraced the other aspects of her life as a college student. “I’ve been able to take different classes because I’m not practicing all the time, which has been really cool for me,” Heffernan said. “I’ve also managed to find a job. I don’t think I would have been able to do that if I was in a sport, to be honest. I’ve just put my focus on different things this semester especially which has been huge. In making the transition from hockey player to college student, Heffernan noted that finding a new identity outside of sports was something that many athletes unfortunately experience. Since retiring from hockey, Heffernan has stepped out of comfort zones and has been able to refocus her priorities onto building closer relationships with family and friends that are outside of the sports world. Her roommate, senior Jill Scyocurka, faced similar hurdles through her time at Harvard. Coming in as a lacrosse player, she had suffered several torn ligaments in her knee at the end of her high school spring. As such, she eventually shifted her focus onto sailing in her sophomore year. But after a herniated disc this summer and fall, Scyocurka realized that she couldn’t continue athletics in her final semesters. “It was hard at first to imagine what my experience at Harvard would be like,” Scyocurka said. “At first, I was really frustrated; it felt like I was wasting time and not appreciating my experience at Harvard. But I’ve realized how lucky I was to have such great friends. I really spent that extra time [outside of training] solidifying my friendships and relationships. It’s been so nice to focus on my friends and teachers here at Harvard. I even took an acting class that I’ve been wanting to take since freshman year. Reflecting on her experiences at Harvard, Heffernan also echoed similar sentiments. “I wouldn’t take back anything,” Heffernan said. “I think what I’ve felt without [hockey] is almost relief because the pressure of it is insane. It’s allowed me to find new things and I think that’s the only way to go about things. When you’re going about a huge change, you have to focus on what life is giving rather than what it’s taken from you. Life’s full of changes and you can never expect any of them. “I grew up playing hockey for my whole life; I don’t remember a time when I wasn’t on the ice. I played it until I was 21 years old and now I’m on this new journey to find my new passions."